Chanakya’s Chant follows very definitely in the footsteps of The Da Vinci Code and other historical thrillers. 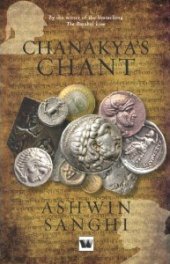 Ashwin Sanghi brackets past and present to create his page turner, throwing in an ancient chant as a leitmotif. It’s amazing that no one thought of using India’s Machiavelli as the subject or partial subject of novel before, but Chanakya with his king making strategies and devious mapping of power works as the main character of a conspiracy thriller – which is a form that has not really been explored by Indian writers of English. This is Ashwin Sanghi’s second novel in the genre – the first The Rozabal Line was self published in America under the pen name Shawn Haigins and then published in India by Westland in Sanghi’s own name, where it promptly caught on. Chanakya’s Chant opens dramatically enough with Paurus – better known to students of history as Porus – succumbing to the seductions of a Lamia steeped in poison who puts a prompt end to his life. The Lamia or vishkanya has been trained and sent by Chanakya. There follows an abrupt shift to today’s Kanpur and to Gangasagar Mishra, a Brahmin, whose father dies when he is 15 and he discovers a mysterious stone with Brahmi inscriptions on it, a tribute to the power of the feminine. Chanakya also loses his father to the rope at an early age and concentrates his entire being on revenge. Jumping between the centuries we follow the lives of Gangasagar and Chanakya. Both Gangasagar and Chanakya follow parallel power lines as they seek to put their candidates at the helm of affairs – in Chanakya’s case, Chandragupta Maurya, in Gangasagar’s the beautiful Chandini Gupta – her name echoing Chandragupta’s deliberately – who is on the way to becoming Prime Minister. Gangsagar is, of course, a reincarnation of Chanakya minus the ugliness and modern India and that ancient country known as Bharat seem to share the same manipulations of power proving that the more things seem to change, the more they remain the same. The characters who haunt Bharat, readers of history will immediately recognise – Alexander the Great, Seleucus Nicator, a rather disappointing Megasthenes – and among the historical set pieces there is that famous confrontation with Paurus that is made much of in the Indian history books. Not that Paurus emerges as much of a ruler after uttering those famous lines. Nor do we actually get many insights into Chandragupta’s capabilities or even Chandini’s barring her beauty, but since the book is a racy page turner, that lack of in-depth characterisation does not really matter. Occasionally in fact it gets so racy that the page is peppered with two paragraph incidents, but Sanghi does tie up his loose ends wherever possible, though the reader’s head is also likely to spin as conspiracy follows assassination follows plot follows conspiracy again. Historians may quibble with some of his details and descriptions, but if you have nothing better to do on a long flight or a train journey you could do worse than pick up a copy and flick through it. 2 Comments on "Machiavellian Conspiracies"